Target 2 stands for Trans-European Automated Real-time Gross Settlement System. It is a reflection of capital flight from the “Club-Med” countries in Southern Europe (Greece, Spain, and Italy) to banks in Northern Europe. Please see Target2 and the ELA (Emergency Liquidity Assistance) program; Reader From Europe Asks “Can You Please Explain Target2?” for a more compete description. 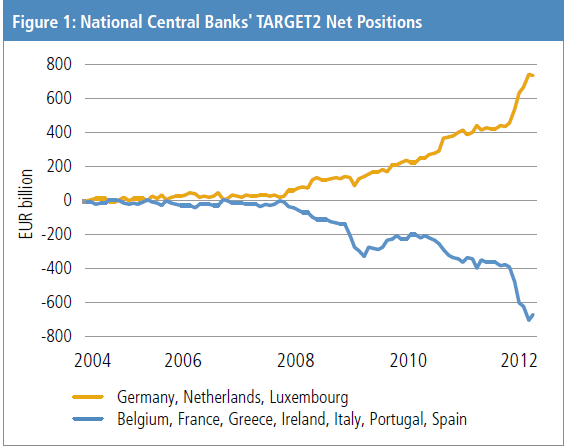 There is much misinformation floating around on how Target 2 works, what Germany’s liabilities are, so please click on the above link if you are interested in target 2 balances. The following chart from PIMCO article TARGET2: A Channel for Europe’s Capital Flight shows the capital flight through March. The problem has accelerated since then, because of fears in Spain and Italy. Those wishing to see more can follow Michael Pettis on his blog China Financial Markets which I consider one of the very few “must read” sites.